MACUCC: SPOTLIGHT: North Falmouth Offers Game Show Event. Everyone's a Winner! MACUCC: SPOTLIGHT: North Falmouth Offers Game Show Event. Everyone's a Winner! SPOTLIGHT: North Falmouth Offers Game Show Event. Everyone's a Winner! The North Falmouth Congregational Church was certainly abuzz with activity this spring. Literally. The church held an "Upper Cape Bible Challenge Contest" to support local charities, and participants had to buzz in their answers. "Our outreach team normally gives money to charities, but this time we wanted to truly recognize the organizations and promote their causes, so we made a game out of it," explained Rodney Rountree, an active member of the church. "We wanted to do more than cut a check." 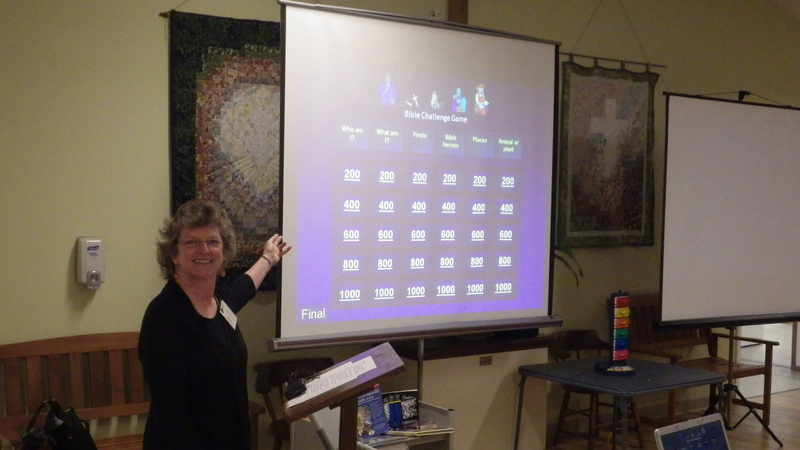 The North Falmouth church invited teams from two other churches in the area, First Congregational Church and Waquoit Congregational Church, to compete in a fast-paced game-show style trivia contest about Bible heroes, places, and firsts. North Falmouth put up the prize money and First Church provided the facilities. All three churches provided baked goods for the concession stand. The winner received $1000, second place $500, and third place $250 for their sponsored charities. Prizes were awarded to representatives from each charity at the event conclusion. North Falmouth competed on behalf of the Upper Cape Relay for Life (American Cancer Society), the First Church team for the Falmouth Service Center, and the Waquoit Church team for Habitat for Humanity of the Cape and Islands - Falmouth Builds Together. The church bought a special buzzer system for the event that they hope to use for the Sunday School program, and had an in-house trial of the buzzer, computer equipment and game questions to ensure all went smoothly the day of the event. The public was invited to attend and support their favorite church, as well as their favorite charities, as audience spectators. The event was advertized in local newspapers in an effort to attract members of the public that might want to support a favorite charity, but were not necessarily church goers. Tickets to the event were free, but donations to the organizations were accepted and concession proceeds were donated. Over 70 people attended the event, where they watched the large screen projection of the game board and cheered on the contestants. "People were really getting into it," said Rountree. "Some team members were so excited they kept slapping the buzzer too early." Pastors from each church served on a panel of three judges to determine validity of answers, and rules (below) were enforced. The event didn't raise much money, but it raised a lot of awareness. "Although this was a great fellowship event, we wanted to reach beyond the congregation," said Rountree. "We managed to team up with other churches in town, while supporting and bringing awareness to the local charities." The North Falmouth Bible Challenge was truly a winning Daily Double. You can contact Rodney Rountree at the church office at (508)563-2177 orofficenfcc@gmail.com. The host will control the overall flow of the game, will repeat all questions and answers and call on designated speakers to choose and/or answer questions. The host is responsible for introducing the officials, teams, and game, reading the categories at the start of each round, reading the questions, and judging the answers (however, see judge panel). If no correct response is given, the host is responsible for reading the correct response. An official scorekeeper will track the team scores which will be displayed continuously to the audience on a big screen. Advancement to the next question will not take place until the scorekeeper is ready. Scorekeeper’s assistant – an assistant will keep a hand written score tally and assist the scorekeeper to keep track of the score and make corrections if necessary. If a team provides the correct response to a clue, they earn the value of the clue. If they answer incorrectly, the value is subtracted from their score. The Game Operator - will control the PowerPoint game program, and buzzer tower reset button. The Game Operator is responsible for identifying to the host which team was the first team to buzz in correctly (pending input from the Game monitor). The Game Monitor – Will insure that the buzzer rotates among team members appropriately after every five questions, and assists the host in keeping track of which team has control of the board (last correct answer). Also will insure that hands are in the correct position resting in their laps or at their sides prior to buzzer slaps and that buzzer riding does not occur (i.e., after a slap, the hand must return to the resting position, repeated slapping of the buzzer is not allowed). The monitor will inform the game operator and/or host if a buzzer slap is invalid. Judges – pastors from each church will serve on a panel of three judges to determine validity of answers. Rounds – The quiz game has two rounds of 30 questions each. For each round there will be five questions of different values in each of six categories. Categories for each round are selected randomly among a pool of categories prior to the event. Teams will receive a list of the potential categories prior to the event, but will not know which of the categories will be used. The questions range in value from $100 to $500 in the first round and from $200 to $1,000 in the second round. The team with the lowest score in the first round gets to lead off in the second round and choose the first question. Rounds will be halted if not completed in 20 minutes and the event will proceed to the next step. Bonus double - There are three bonus double questions randomly hidden on the board – one in the first round and two in the second round. Only the team that picks a bonus double may answer. When a bonus double comes up, the scorekeeper should announce the scores of each team. The controlling team can wager any amount up to the twice maximum value in the round, so up to 1000 for round 1 and 2000 for round 2. The team that picked the Double should decide how much they want to wager and then announce their wager to the scorekeeper. After the question is read the team may discuss the answer, but they only have 15 seconds to give a response. If they give an incorrect response, the host reads the answer. No other teams are given the option of buzzing in. Final Challenge - At the start of the Final Challenge the host should pass out the Final Challenge cards and the scorekeeper will announce the team total scores. The host will then read the question category and the teams will have 30 seconds to discuss their challenge bid. A team can risk any amount up to the amount they have already won. Teams should write their bid on their Final Challenge card. The host will then read the Final Challenge question and the teams will have 30 seconds to write their answers on the card. At the end of the 30 seconds, teams display their cards in turn (beginning with the team that has the lowest score) and final scores are tallied. The team with the highest score wins. Start - A team is randomly chosen to go first, and begins the game by selecting a category and monetary value (e.g. "Bible firsts for $100"). The host then reads the question, AFTER which the currently designated speakers on any team can buzz in. Designated speakers - Only one team member can serve as the team designated speaker and have control of the buzzer for a given question series. The designated speaker can consult with teammates before buzzing in and up until the host calls for the answer. Control of the buzzer passes to the next team member (left to right) after every fifth question. Buzzing in – Only the current designated speakers may buzz in for teams. Hands must be resting in their laps between each slap. “Riding” of the buzzer is not permitted. Buzzers can NOT be slapped until after the announcer reads the question out loud in its entirety. If the Controller determines a team has buzzed in too soon, or if the Monitor determines incorrect buzzing, then the affected team(s) will be disqualified and the question will go to the first team to correctly buzz in. The designated speaker who buzzes in first may only answer a question when called on by the host, at which time the team MUST answer immediately. That is its better to do your team consulting BEFORE you buzz in because once recognized by the host, you must answer immediately. The team that chooses a category and question does not automatically answer the question, only the team that hits the buzzer first AFTER the question is read can answer the question. (Exception, only the team that selects the double bonus question can answer that question). Wrong answer - If a question is not answered, or answered incorrectly, the second team to have hit the buzzer will be offered the opportunity to answer the question: they may answer the question or decline. If no team answers the question, the host will provide the answer before play resumes. Resume play - The team that answers a question correctly gets to choose the next question. If no team answers correctly, then control of the board will move to the last team to answer correctly. Challenging answers - Answers may be challenged by any team and will be ruled on by a panel of judges. The panel of judges may also overrule the host if they feel an alternative answer is valid and should be accepted. Final challenge question – play will advance to the final challenge question after completion of the second round, or when the game controller signals game time is up.